Each year, approximately 10 million turkeys are enjoyed in the UK on Christmas Day. While King Henry VIII is often considered the first English monarch to enjoy turkey, Edward VIII eventually made eating turkey fashionable at Christmas – a luxury until the 1950s, when refrigerators became commonplace in standard homes. In recent years, however, the turkey crown has risen in popularity, with around 70 per cent of turkeys purchased at Christmas being either a crown or pre-prepared joint. These findings from research conducted by Paul Kelly, Managing Director of luxury turkey brand KellyBronze, re-ignites the crown vs whole bird debate amongst British consumers. First and foremost, the issue of optimum flavour arises with the selection of a crown over the full bird. A pre-prepared joint with the legs and wings removed, turkey crowns are completely bereft of the leg meat – the proverbial jewel in the crown of almost every bird, harbouring dark meat considerably richer than the often bland breast meat. Boneless crowns are even less exciting. Already widely considered a dry, unappetising bird by a huge number of Brits (YouGov research from 2016 suggests 48 per cent opt for turkey alternatives at Christmas), crowns provide white meat with considerably lower fat content. While the white breast meat is, arguably, healthier, it’s the fat which keeps the bird succulent when roasted properly. Moreover, in addition to featuring additional bones (promising further bone marrow) essential for opulent, revitalising stocks, full birds also contain often discarded cuts and offal which easily lift gravies or enrich stuffing when fried in a little butter and finely chopped or blended. 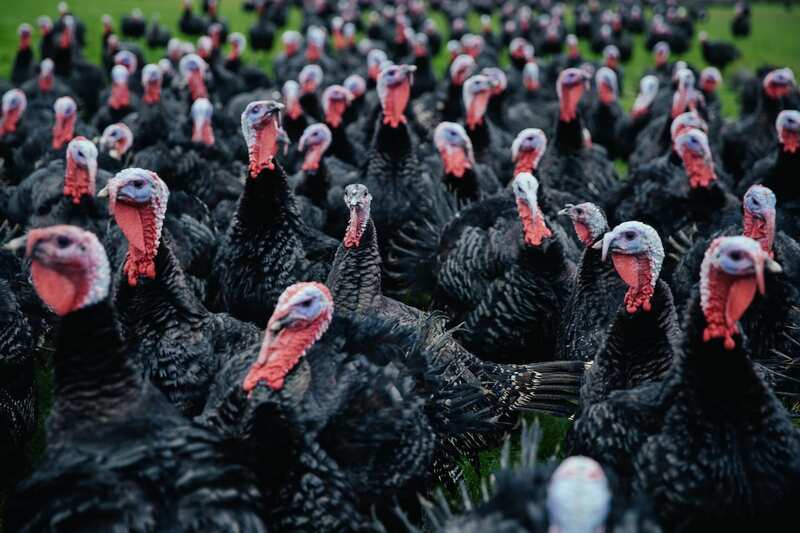 Turkey expert Paul Kelly also highlights a wider sustainability issue in his findings on the soaring popularity of turkey crowns. While public perception suggests crowns are easier to cook, hundreds of thousands of legs and wings are thus wasted in production. An alarming finding considering the UK’s renewed popular focus on reducing food waste – a topic that has been so frequently reported in 2018. Price is another key component in the consumer argument for the rise in popularity of the turkey crown, with many believing crowns are a cheaper alternative to a whole bird. With this, Paul Kelly has kept an eye on the cost of whole birds as opposed to crowns for the past couple of years. Considering the average 2017 price per kilogram of fresh, standard and basted turkeys across a number of UK retailers, including the ‘big four’ supermarkets (Tesco, Sainsbury’s, Asda, Morrisons) and the likes of Aldi, Lidl, Marks and Spencer and Waitrose, the average cost per kilogram of whole turkeys are 44 per cent less than the cost of turkey crowns. “The shocking truth that a turkey crown is nearly double the cost per kg of a whole bird should be reason enough to make the switch this year. All turkey producers add the cost of the legs that are removed on to the price of the crown, so when you buy a crown you have paid for the whole bird regardless. With all the amazing recipes that use the leftovers from a whole bird, there is no excuse for buying a crown. There are however so many other benefits to cooking a whole bird. First of which is the ability to make a good stock – you need the bones from the legs and back which contain the bone marrow to create a delicious stock, which can then be used to add bundles of flavour to other dishes. 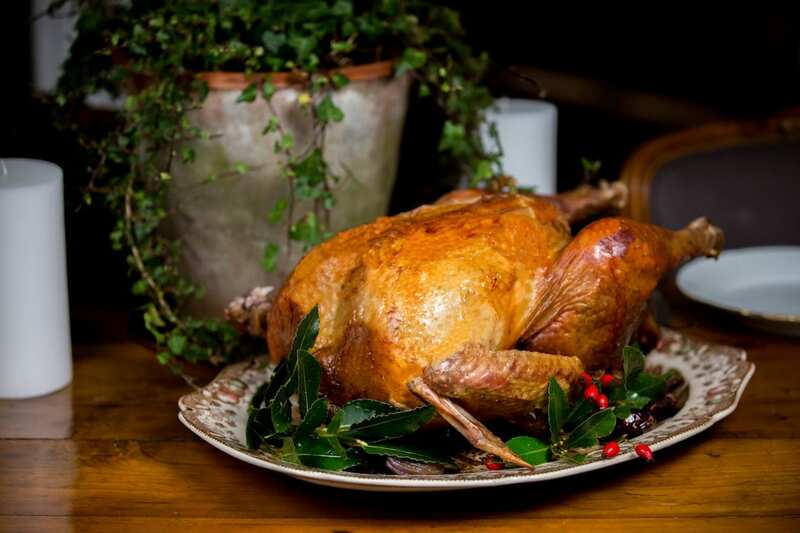 What’s more, the KellyBronze Managing Director (and Guinness World Record holder for carving and plucking turkeys) has shared a selection of simple steps to cook entire birds to perfection this Christmas. Take the turkey out of the fridge and leave to stand for at least two hours, allowing it to reach room temperature before cooking. Preheat your oven to 180°C, or 160°C for fan ovens. Remove any trussing/string from the bird (and the pack of giblets from inside the cavity, if provided) and place in to a large roasting tin, breast down. Add your favourite vegetables to the tin along with one pint of water and the giblets, and season well. Place in to the preheated oven, with no foil. Remove from the oven halfway through cooking, turn the bird over and puncture right through the thighs. Season well before returning to the oven. Check the core temperature using a meat thermometer 30 minutes before the end of the cooking time. Remove from the oven when the core temperature reaches just under 65°C, and leave to stand for a minimum of 30 minutes before carving. Do not cover with foil! Further information on KellyBronze can be found here.